Transparent Hands is proud to collaborate with School of Business and Economics at University of Management and Technology, Lahore. Both the organizations signed Memorandum of Understanding (MoU) on 14th November, 2018 with the aim to involve the students of SBE in community work at Transparent Hands. 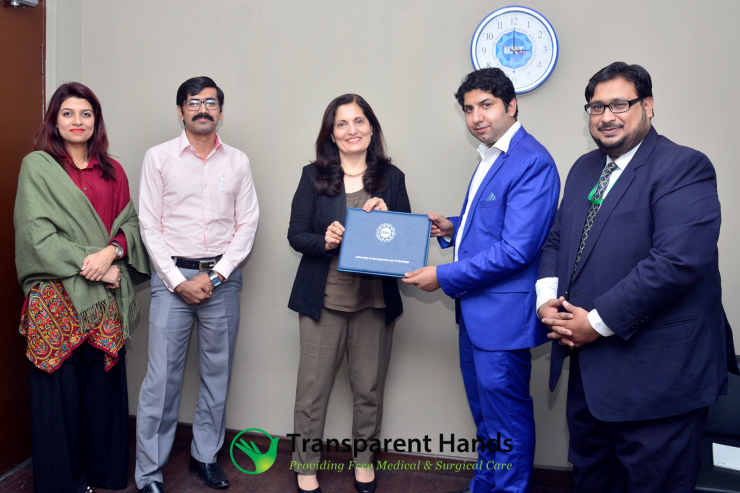 The MoU was signed by Mr. Raheel Abbas, Director of Operations Transparent Hands and Dr. Naveda Kitchlew, Associate Dean Academics and Internationalization, Associate Professor in Department of Management of SBE at University of Management and Technology. The main objective of MOU is to involve the students of SBE into community work in various departments of Transparent Hands. The students will not only learn about social entrepreneurship, they will also play their part in creating an impact in the lives of underprivileged patients through their skills and expertise. Both the organizations will now support each other in facilitating the deserving patients all over Pakistan.